Subterranean termites live in underground colonies or in moist secluded areas above ground that can contain up to 2 million members. They build distinctive "mud tubes" to gain access to food sources and to protect themselves from open air. They can build tunnels through cracks in concrete. The most destructive kind of termite. 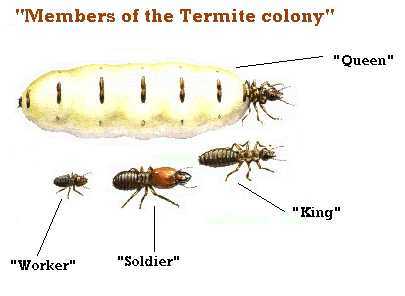 Termite colonies are organized into castes depending on tasks - workers, soldiers and reproductives. The characteristics of a subterranean termite are dependent on the termite's role in the colony. Cream-colored Worker subterranean termites are 3,1  9,5 mm in length. Soldier subterranean termites are of a similar body length, but are distinguished by their powerful mandibles. Solider termites have cream-colored bodies and brown heads. Reproductive subterranean termites are approximately 2,54 cm long. Termites typically feed on dead plant material such as wood, bark and straw, being able to digest woody fibres with the help of bacteria that live in their stomachs. Acting as highly efficient decomposers, the termites return the plant nutrients to the soil through their faeces and saliva. Lacking pigment and a protective exoskeleton, termites operate mostly underground, but some species forage above ground after dark. In some parts of Africa, there may be as many as 10 000 termites to a square meter of soil surface, so it is not surprising that these insects also feature in the diet of numerous other species. The hard, saw-toothed jaws of termites work like shears and are able to bite off extremely small fragments of wood, one piece at a time. People often confuse ants and termites. Both insects live in social colonies, and may take up residence in or near your home. Knowing how to identify ants and termites will help you decide when to call Pest Control Technologies. While they appear similar at first, a closer look reveals some distinct differences. Harvester Termites- commonly known as harvester ants, are pests of natural pastures and compete with other animals for food. They do not attack wood, but live on grass and non-woody plant materials containing cellulose. They are of great importance as they destroy grazing veld and encourage soil erosion. They can cause extensive damage to cultivated crops such as wheat. Garden lawns, sports fields and parks are often attacked during the winter months. Unlike subterranean termites, harvester ants collect their food in the open. The only indication of the presence of these insects is the denuded (bare) areas containing heaps of soil and foraging holes. Harvester ant workers that forage on the surface are active during the warm part of the day during winter, and at night in summer, depending on the temperature. They are named harvester ants because they clip off grass and cellulose fibre and carry such back to their nests. The result is large yellow patches on lawns and in severe cases, patches of soil appearing where grass has been carried away in large quantities. The colonies live entirely underground and the workers will only surface to forage. The nests are quite large, being up to 75cm in diameter and they may be as deep as 800cm. In heavily infested areas, all nests are interconnected and form one large colony. The harvester ant is a comparatively large species, the soldiers reaching a length of almost 25mm and the workers approximately 19mm. They have black or brown heads, with clearly defined stripes across the back of the abdomen. The soldiers have very large mandibles. Harvester Termites destroy your lawn by cutting the grass in short lenghts and carrying it into the nest where they feed on it.